Week five of a broken ankle was much like the weeks previously but with less pain. I spent the majority of the week sleeping and resting as much as possible to ensure prime bone healing in the hope that Friday would be the day that I would have my cast taken off. Friday was filled with dread and nerves as every Friday spent at hospital is. I had been brought in to see if I could have my cast taken off early so I wouldn’t have to cancel my second holiday this year. As soon as I arrived at the Fracture Clinic I was instructed to go to a different area, which turned out to be the “Out Patients” area – the signs were looking good. I was seen by the nurse who told me I needed to go and have my cast taken off. To be honest as excited as I was to have my cast taken off, it is still terrifying! Suddenly my ankle felt very vulnerable, like the slight knock would break it again and I’d be back at square one. The sight of my leg out of cast was also quite a shock. There wasn’t as much dry skin as I’d thought there would be but my calf had completely wasted away through it being rested for 5 weeks. It’s very strange to look at. Next step was X-Ray. I was wheeled to the X-Ray room and ever so carefully positioned my foot on the table, treating it very much like a precious china teacup. X-Ray completed I headed back to the Clinic and waited for the Consultant. The Consultant arrived and told me everything is looking well and that I will be put into a boot so that I can start to partially weight bear. I was so scared that they were going to put another cast back on after seeing my ankle was still bruised that I didn’t quite believe it. I think I was in shock as he explained that I would be able to put about 1-2 stone of weight on my ankle and need to practice walking over the next 3 weeks. The physiotherapist arrived with the boot and fitted it for me then told me to walk using my crutches. Again, totally terrifying. Still feeling very precious about my ankle I was scared to put weight on it and ended up scraping the floor with the boot and hopping on my good leg. She told me to try again, informing me that the boot cushions my foot and helps carry my weight. So I tried a second step, this time I managed to actually put some weight on it. I carefully stepped around the consultation room feeling proud as punch. The Physiotherapist was pleased to see I was confident in stepping on my leg as many take a while to do so. I left the hospital with a huge smile on my face and a note saying I could start working from home the next Monday. I said goodbye to the nurses and that I’d see them in three weeks, when I aim to walk confidently into the clinic with my boot and perhaps just the one crutch. Goodbye wheelchair! At home I was excited to walk around my home and be able to feel the air on my leg and ankle again when I removed my boot. 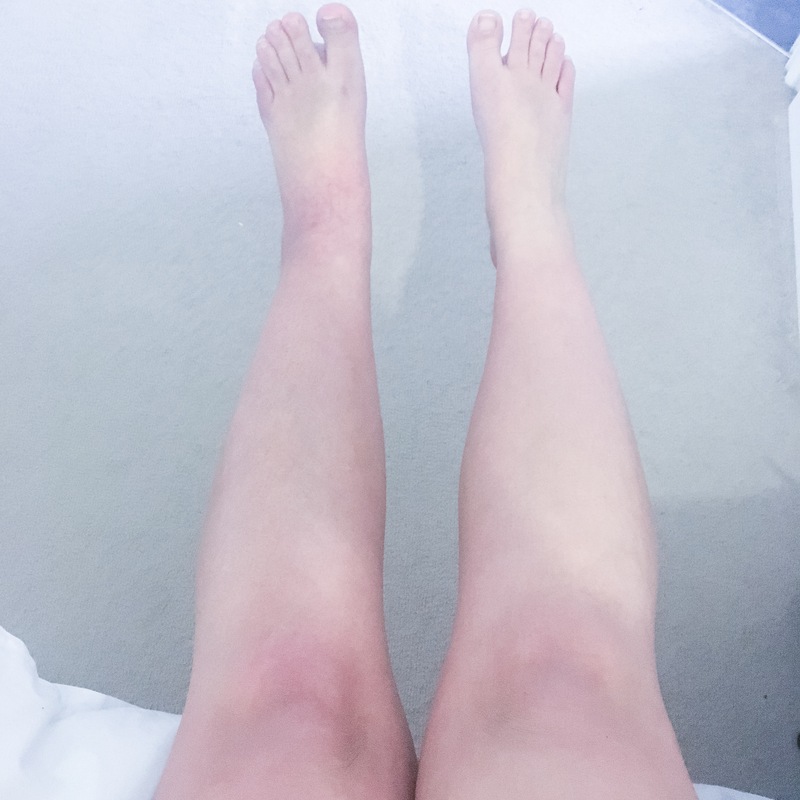 My Grandad, who was a Plaster Technician, had advised me to practice moving my ankle in warm water to help gain some mobility back into it slowly as my range of motion is extremely restricted due to the damaged ligaments and muscles surrounding my break. So every couple of hours that’s what I plan to do between short walks around my house and resting. Friday ended in tears of joy as I managed to finally climb the stairs on two feet instead of shuffling up on my bum. There was one slight panicked moment but I overcame it and managed to the top without giving up. It’s strange to think that 2 months ago I would have laughed if you told me the sense of achievement I felt at the simple task of climbing stairs! So glad to hear you’re ankle is getting better. I think it’s important to keep some perspective that there are others going through really difficult physical health stuff with a lot more uncertainty around it (e.g. cancer treatment, investigations etc). Wish you the best for the rest of your recovery! Thanks Kirsty, it’s slowly but surly getting there. It’s tough to deal with physically and mentally but know there’s many out there with worse injuries. Just want to say what a well written and personal account of your injuries and the healing process. It’s been of great comfort to me as I enter into week 2 of my fractured ankle. Thank you making this diary, I have taken a great deal of comfort from it, thank you!